Green leafy vegetable with small tender leaves that make excellent salad greens alone or mixed with other greens. 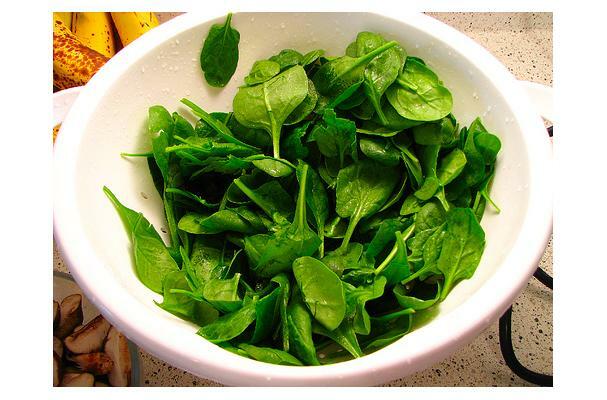 Spinach provides a good source of iron and should be washed thoroughly and stems removed prior to eating. Very high nutritional value. Particularly rich in iron, calcium, antioxidants and several vitamins (A, C, E, K and complex B). There are three different types of spinach generally available. Savoy has crisp, creased curly leaves that have a springy texture. Smooth-leaf has flat, unwrinkled, spade-shaped leaves, while semi-savoy is similar in texture to savoy but is not as crinkled in appearance. Baby spinach is great for use in salads owing to its taste and delicate texture. Flavors: sweet and savory, sometimes bitter sweet. Choosing: Choose spinach that has vibrant deep green leaves and stems with no signs of yellowing. The leaves should look fresh and tender, and not be wilted or bruised. Buying: Available at all major grocers and farmers markets. Great to use in salads. Cleaning: Rinse lightly ad shake the leaves to remove any excess water. Mature spinach may need to be submerged and swished in water 2-3 times, as spinach is grown in sandy soil. Store fresh spinach loosely packed in a plastic bag in the refrigerator crisper where it will keep fresh for about five days. Do not wash it before storing as the moisture will cause it to spoil. Cooked spinach doesn't store well. History: Native of Asia, probably in Persia. Interesting post as for me. Thank u for posting this information.